* This is the core RO-585 5-stage 85 gal/day Reverse osmosis RO system without storage tank and dispensing faucet. 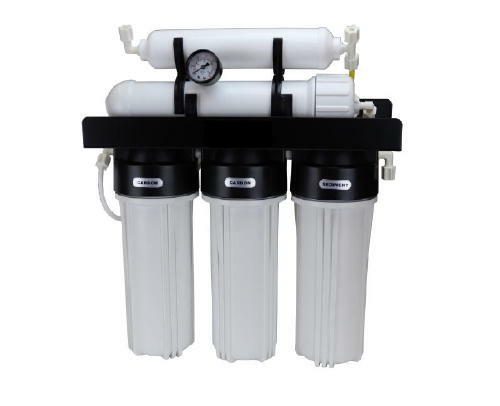 If you have already an existing RO system and would like to replace just the core system with brand new filters and housings, this system is perfect for you. This system is a complete system ready to be installed. It includes all filters, tubing, installation hardware, installation manual. All filters and membrane are standard size. ** Important Note: All reverse osmosis systems, residential or commercial, are required to have drain water when making pure water. Our RO systems have built-in auto-shut-off valve so when the storage tank is full, the system shuts off automatically. The ratio of pure water to drain water for our RO systems are 1:3 (calculated). Average RO systems are typically 1:4, so our RO systems run more efficiently. Minimum water pressure required to operate the system is 45 PSI. Ideal pressure is 85 PSI.